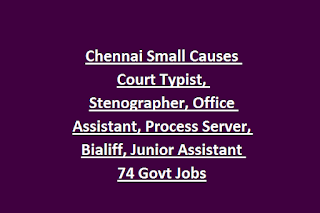 before the closing date of 08-03-2019 for this Chennai Court Office Assistant and other posts. Applicaion form is avaialble to download at https://districts.ecourts.gov.in/india/tn/chennai/recruit. Candidates selection will be based on written exam or interview or Skill Test for this Chennai Small Court Office Assistant and other posts. Detailed information about this Chennai District Court recruitment post wise vacancies, qualification, application form submission procedure and other details are updated below. 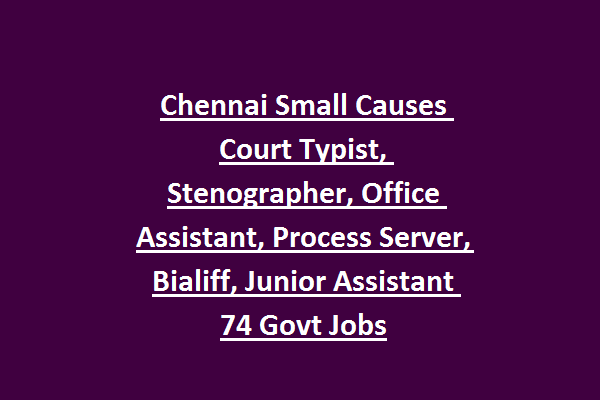 There are total 74 posts are in this Chennai Small Causes Court, recruitment 2019. Upper age limit for General candidates is 30 years. For OBC-32 years, For SC/ST-35 years. For Stenographer: Stenography Certificate and SSLC qualification is required. Candidates selection will be based on written exam and/or Skill Tests and personal interview followed by documents verification. Candidates have to send the filled application to Chennai Small Causes Court along with all required documents. Last date to reach the filled application form is 08-03-2019.